A Seudat Hodayah is a special meal that Jews host on the occasion of a near miss—healing from an illness, returning from a dangerous trip, or narrowly escaping an accident—or just to give thanks for some important milestone. In ancient times, when the Temple in Jerusalem still stood, we would have offered a special thanks-giving sacrifice on such an occasion and invited our family and friends to help us eat it. But these days, the dining table has taken the place of the altar. Instead of bringing a sacrifice, we host a meal for friends, family, and neighbors. We tell about our brush with ill fortune and give thanks for our delivery. And, of course, we eat! Some people even serve food with some symbolic connection to whatever event they came safely through. And because it’s a Jewish meal, we learn a bit of Torah, say Birchat HaGomel, and sing (not recite, sing!) some choice bits of Tehillim. All of this is not only very good for family bonding, but is good mental hygiene after any close call. If one had a brush with death, telling what happened in a protected setting, such as a family gathering, can be very effective therapy. Nothing defeats PTSD and hopelessness the way sheer unmitigated gratitude does! Of course, some types of trauma are best left unverbalized. And that’s where the rest of the text comes in; if telling is too difficult, one can substitute tehilim, poems, or songs that have some specific resonance or symbolic connection to the event. And if you think all this sounds a bit like a description of a Pesah Seder, you’re right! 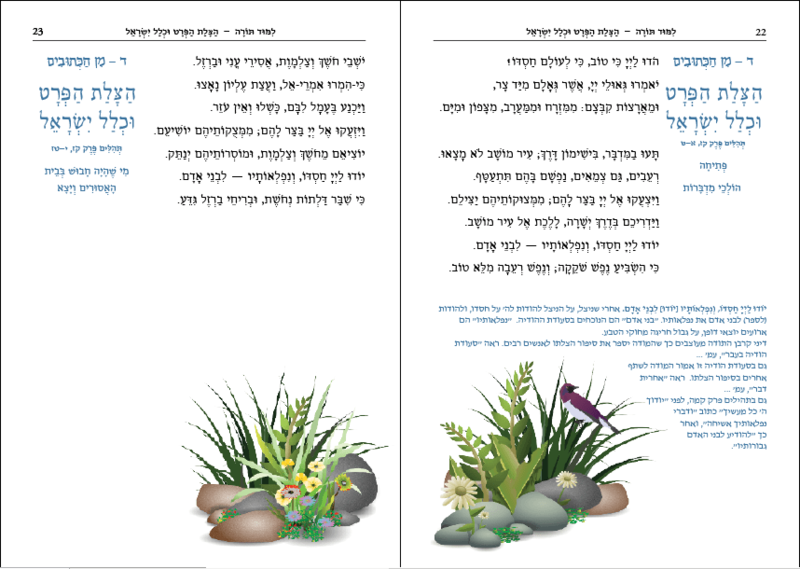 Turns out that the original Seder was actually modeled after the classic Seudat Hodaya: symbolic foods, a bit of Torah to learn, a retelling of the story… and lots of song. L’Chaim! Group orders may also specify custom text on the cover in honor of the event. Discounts available for group orders.